Fieldwork is now finished at High Pasture’s for the 2005 season, but read on for some new discoveries made during the final days on site. 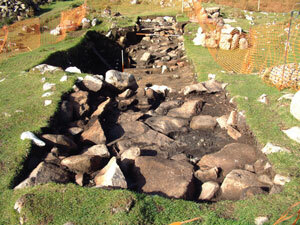 Archaeological fieldwork concluded at the High Pasture’s site in late October. Work during the final days on site included some last minute excavation, drawing of plans and sections, and general stabilisation of the trenches. In particular, we wanted to reduce the weight of the overburden above the newly-discovered entrance to the cave to avoid the possibility of section collapse during the winter months. The image above shows the trenches excavated during 2005 from the east, with Trench 5 in the foreground. 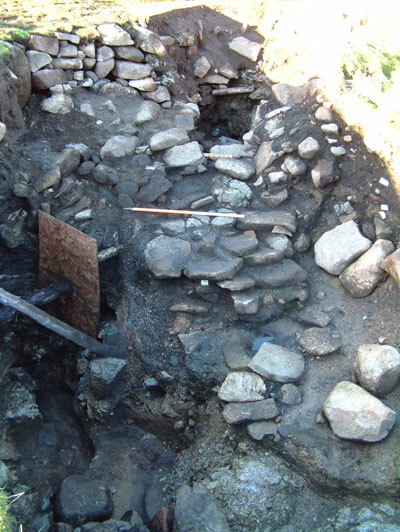 The circular cell and paving are clearly visible in this trench, and work in the final few days on site revealed a circular hearth setting contemporary with the granite paving. Edged with granite cobbles, the hearth contained fire-cracked pebbles and stone, but little charcoal or other burnt materials. The location of the hearth was at the west end of Trench 5, immediately above the low revetment wall (see image below - taken from above). Scales = 1m and 0.25m. 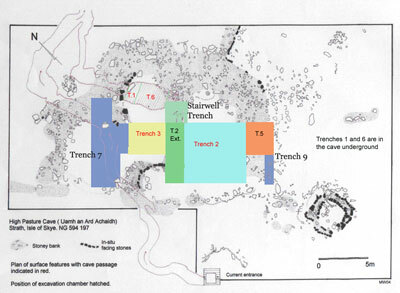 The image below shows Trench 2 and the associated extensions from the southeast, before we cut back the overburden above the man-made entrance to the cave and finished sectioning of the steps leading up to the entrance. The overburden above the entrance comprised a rich brown soil with granite and limestone boulders. The only finds recovered during the removal of this material was a pebble hammer/grinder and a fragment of a rotary quern stone (upper stone), complete with central funnel-shaped hole and handle hole. Of significance here is the fact that the fragment of quern stone was found to refit with a similar fragment, recovered during the excavation of the Trench 2 extension before we found the entrance and the associated burials. The relationship between the deposits in which these two conjoining fragments of quern were found requires further analysis and interpretation. During the removal of the archaeological deposits covering the steps leading up to the entrance, we uncovered another hearth setting (see image below). 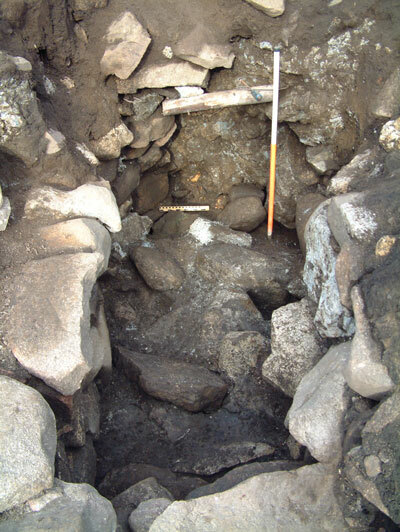 This was situated to the southwest side of the entrance passage and like the hearth uncovered in Trench 5 is edged with small granite and limestone stones. The plan below shows the location of Trenches on site and the position of the two hearth settings described above, marked H1 and H2. With the removal of the overburden above the entrance passage, the problems of collapse have been reduced and stresses relieved on the remaining stone corbelling. 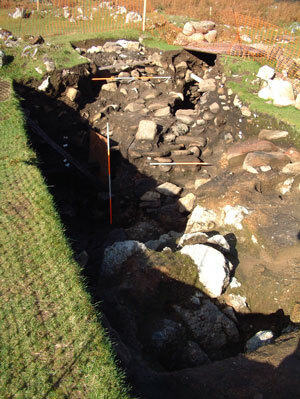 The stabilisation of the entrance has also resulted in safer working conditions for the archaeologists in this area of the site. This allowed us to take a closer look at the stonework in the passage that has been uncovered so far, before we put the covers on the trench for the winter months. It was during work in the entrance passage, to remove the last few boulders and fill for this year, that new and exciting discoveries were made. The image above shows the entrance to the cave from the southeast, with the steep steps leading in from the foreground. The courses of stonework on the left-hand side of the passage are well preserved and can be seen merging into the natural limestone bedrock at the back of the passage. 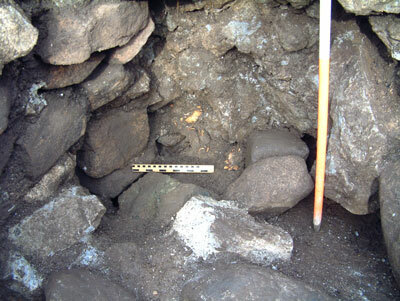 A fragment of sandstone quern stone was found built into the remains of the corbelling, that are just visible in this image above the side walling. 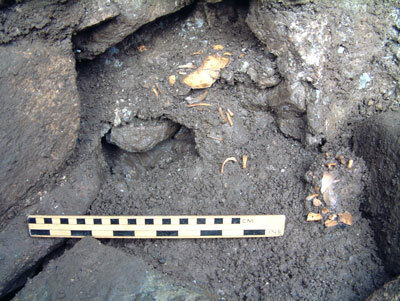 However, it was while removing the last of the deposits from the backfilled entrance for this year, adjacent to the limestone bedrock at the rear of the passage, that more human bone was uncovered (visible has two light orange-coloured patches in this image above the smaller of the two scales - 0.25m). 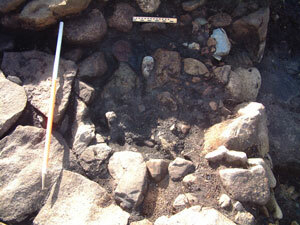 The image below shows a closer view of the remains, indicated by two discrete deposits of bone, while the fragment of quern stone is visible in the remains of the corbelling (pinkish-coloured sandstone). After discussing the find we decided that the deposits were too important to leave in-situ over the winter months, so we carefully started to record and excavate the remains. The bone formed two discrete deposits approximately 30cm apart and located hard against the natural limestone bedrock. The limestone had helped to preserve the delicate bone, which seemed to be from at least one and possibly two human foetus, but there was the bone of a small animal also mixed with them. Lying on my front the work was slow and delicate, and the bone was incredibly fragile. Therefore, after cleaning up the deposits the best I could, we recorded the remains and lifted the bone complete with the sediment surrounding them. We also wet-sieved the remaining soil deposits between and around where the remains had been lifted. 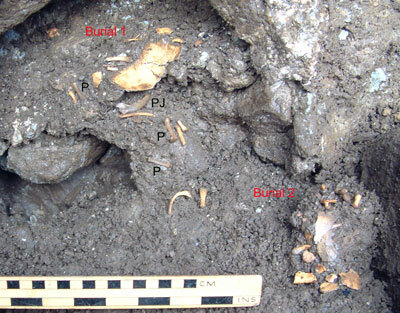 The image above shows a close view of the human and animal remains before removal. The human bone comprises egg-shell thin fragments of cranium, ribs, vertebrae and limb bones, while the animal bone relates to the deposition of a foetal pig. The pig is represented by limb bones, vertbrae and one half of the lower jaw (see image below, which shows location of the pig bones (P) and pig lower mandible (PJ). The deposits of bone were finally excavated under laboratory conditions to minimise damage to the material and to assist maximum retrieval, and has now been delivered to Laura Sinfield (Forensic Archaeologist) at the University of Edinburgh Medical School. Laura is already working on the human remains retrieved from the entrance passage earlier in the year, which include an adult woman (32-35 years of age), a young infant (9-12 months old) and a foetus (4-6 months old). Full analysis of the remains will obviously take some time, but Laura has already confirmed that the new ‘packages’ of bone do comprise two humans and a foetal pig. The size and age of the bone from the new deposits would fit fairly well with the infant and foetus recovered from the primary burial, but the deposits are separated by 0.5 metres of boulder and sediment fill, and are located on different horizontal alignments within the entrance passage. Of note here is the fact that no infant or foetal bone was recovered from the fill of the passage separating the primary burials and the new remains in the vertical plane. We should be able to make more informed interpretations of these burials as soon as Laura has finished her post-excavation analysis, and if possible DNA analysis may be used to see if the human remains are related in any way to each other. All of the finds from excavations on site this year have now been despatched to the National Museums of Scotland and other specialists, and we hope to post reports of their findings on the website in due course. In the meantime, please revisit the site for updates. These may be sporadic now that fieldwork has finished on site, but we shall be posting new information as and when it becomes available. One important piece of news received over the last week is that we have been successful in obtaining funding for the High Pasture Cave Project from the Highland 2007 fund, money that will be used to enhance the visitor experience to the High Pasture’s site and also enable us to bring in more specialists techniques to help us to understand the site and its formation.